Save your time when you are on-hold! Let another machine listen to on-hold messages! 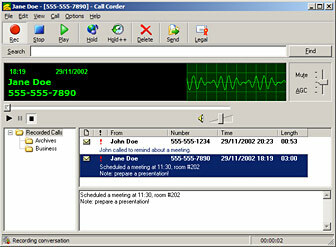 Hold On-Hold is a function of the Call Corder software. AT&T Reports: "An estimated 70% of business callers are put on hold." Telemarketing Magazine: "Over 70% of business callers are put on-hold"
OfficeTeam Survey: "The average executive spends 17 minutes per day on-hold"
CNN Survey: "The average person spends 60 hours per year on-hold"
How many hours did you spend listening on-hold messages? Save your time! Allow this software to handle situations when a machine puts you on-hold. Imagine you have placed a call and were put on-hold. Now you activate Hold On-Hold™, put off receiver and return to your business. When an operator takes the call, he or she will hear an invitation to press a key to reconnect to you: "Please press one to speak to ..."
After the operator presses the key, Hold On-Hold™ alerts you immediately that the other party is available to talk right now, and ask you to pick up the phone. Hold On-Hold is able to play regular on-hold messages as well as hold on-hold. The program is compatible with Windows 98, ME, and Windows NT and 2000. * Based on the research mentioned above. Whether you are a start up, a Fortune 500 company, or anywhere in between, if you were to log the time you were placed on hold, it could amount to hours in just one week. Hours of wasted time and missed opportunities. The Hold On-Hold™ unique approach to filling this void will turn your "on hold" time from a being a waste into a productive time! All rights reserved Call Return service will tell you the number of the person who last called you. To activate, press *69. To de-activate, press *89. Call Return will not return calls to a cellular phone number or a number that has been blocked (see *67 Per-Call-Blocking) or marked "Private".